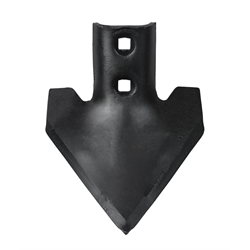 Bolt-On Field Cultivator Sweep, 47 Degree, 6" x 5/16"
We are temporarily out of stock of this item in this warehouse. Please phone us at 1-800-463-8748 to enquire about future availability or shipment from an alternate warehouse. Gaber G47 field cultivator sweeps feature a 47° stem angle and holes that are 7/16" in diameter and spaced 1 3/4" apart. Gaber MegaWing series designed for enhanced weed control. If your field cultivator takes a 3/8" bolt, our oversized head plow bolts are required to make this a compatible fit. Bolt-On Field Cultivator Sweep, 47 Degree, 10" x 5/16"
Bolt-On Field Cultivator Sweep, 47 Degree, 8" x 5/16"